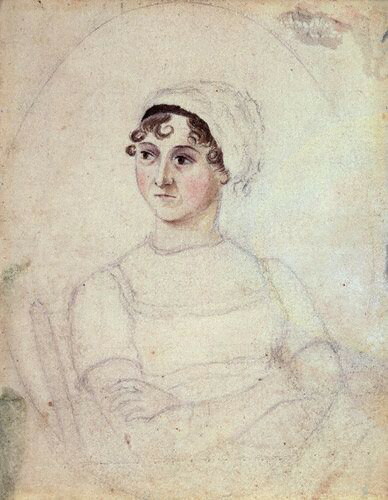 Jane Austen died on this date in, 1817, not in possession of an author photo. This sketch by Cassandra is the most we know about what she looked like. I would say that I am fine with that, except I wrote an entire book in the effort to imagine what Jane Austen was like, so clearly I am not. I’ve been thinking about the notion of the author photo a lot lately, a strange artifice that I had until recently accepted as a given: On the back of the book you are reading, here’s a photo of a person alone (they are always alone), looking variously pensive, combative or wistful — but by definition, always interesting. For here is the person who wrote the book you are holding in your hands! They had an idea, they wrote it down, and now it exists in the world, a physical presence. And here’s what the person who wrote it looks like! What a curious non sequitor, really. Why does a person’s face have anything to do with what is in his or her mind? Yet somehow we accept that it does. My idea of James Baldwin, for instance, is hopelessly linked to that famous picture of him: his prominent eyes, his expression sad and yet profound. Looking at James Baldwin’s picture, you feel you know his heart, just the way you do when you read his incomparable sentences. Which is utter nonsense, of course: the complexity of anyone cannot be reduced to an image or some words. But this illusion persists. And it’s connected to this idea I’ve been struggling with for a while now, of that in writing a book — or doing anything else that might bring one to public notice — you run the risk of becoming, in however small a way, public property. Perfect strangers can read your book and pass judgment on it in Amazon reviews or on Goodreads, with as much impunity as if they were behind a one-way mirror. They can make fun of your author photo, too — that is, they can make fun of you. Being famous — or at least “known” — is universally acknowledged as a good thing in our culture, a sign that you’ve attained some level of distinction in whatever you are trying to do. So much so that even remarking on it sounds absurd, as if I were trying to explain the customs of earthlings to visitors from another planet. Yet I am deeply uneasy with this, even if saying it sounds both grandiose (I am in very little danger of becoming famous) and churlish (I’m complaining about this? Really?). The author photo had always seemed to me a thing that merely existed, the way Stonehenge exists, or the Brooklyn Bridge. Seldom do we stop to contemplate the sweaty grunting and engineering prowess required, the problems that had to be solved and the risks taken. Likewise, but with less stone, the author photo. How did the author choose a photographer? Was he late, did she get lost on the way? Was the author hung over, anxious to get to her next appointment, self-conscious about his receding hairline? Did they stare, as I did, at the variety of poses and backdrops and facial expressions I ended up with, and wonder, What expresses the spirit of my book? What expresses the spirit of me, and what kind of self-important question is that, anyway? Yet this is your avatar, the thing that goes out in the world to represent you. How weird.